The Bison volleyball teams played Nov. 11 and Nov. 12 at home against UBC Okanagan. On Friday, the women’s team, ranked fifth in the nation, had a poor first set, but came back to win the second. The Bisons tied the third, 19-19, and won the fourth. Unfortunately, during the fifth and deciding set, UBC managed to get a few decisive kills and won the game 3-2 (25-17, 18-25, 25-23, 15-25, 15-13). The men had better luck. Through consistent play, the Bisons overcame a strong performance from fourth-year UBC player Riley McFarland to win the first set and refused to let up for the rest of game. 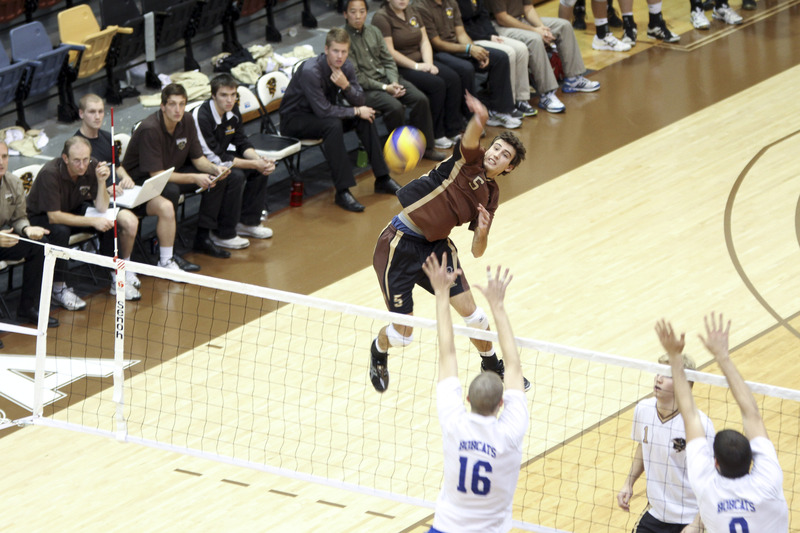 Led by co-Captain Chris Voth who got 13 kills, the third-ranked Bisons won in straight sets 3-0 (25-23, 25-20, 25-17). The following day, the women were eager to rebound after their loss. But after the Bisons lost the first set, it seemed like the previous day’s result might repeat itself. Fortunately, the Bisons dug deep and won the second set, and then took the third and fourth sets en route to a 3-1 (19-25, 26-24, 25-18, 25-19) victory. In the men’s second game of the weekend, the Bisons once again won in straight sets (25-19, 25-22, 25-20). The men’s win on Saturday puts them at a 6-0 winning streak, while the women’s team sits in fourth place in the Canada West standings with a 4-2 record. Both teams travel to play the Thompson Rivers University WolfPack this weekend. Nov. 11-12 the Bison men’s hockey team hosted the University of Lethbridge Pronghorns for two games, while the women travelled to Lethbridge for two games. The seventh-ranked Bison men’s team started off strong in their game on Friday with a power play 55 seconds in. Blair Macaulay would capitalize on the early advantage, scoring 2:46 in. The Bisons quickly followed up with another goal, less than 20 seconds later. Two minutes later, Bisons captain Mike Hellyer scored a third goal, and just 23 further on the Bisons scored their fourth unanswered goal of the game. The Pronghorns would fight back and cut the lead to two before the period was over, but the only other goal scored would be a late Bison goal for insurance, as the Bisons held on for a 5-2 victory. On the same day, the women’s team lost their opening game of the weekend. The Pronghorns scored in the first period, but a nice play by Bison Maggie Litchfield-Medd tied the game midway through the second period. After the Pronghorns scored the go ahead goal in the final minute of the second frame, the Bisons needed to play 20 minutes of mistake-free hockey. Unfortunately, a tripping penalty on the Bisons resulted in a Lethbridge power play goal which made the score 3-1. The Bisons managed to get a power play goal of their own, but the Pronghorns held on for a 3-2 victory. On Saturday, both Bison teams had great games. After the first period ended tied 1-1, the men’s team exploded in the second period, scoring early and often. They scored three second period goals to take a 4-1 lead heading into the third. The teams exchanged a goal in the final frame, as the Bisons earned their second 5-2 victory of the weekend. The women’s game was much closer. 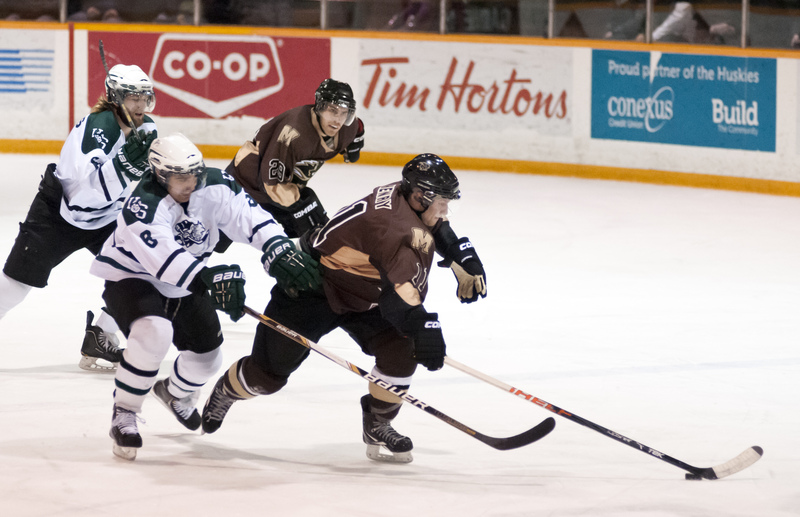 After neither team scored in the first, the Bisons were the first to get on the board in the second period, but the Pronghorns managed to overcome the Bisons intense pressure and tied the game as the two teams headed into the third. The Bisons would grab the lead late in the third and guaranteed victory with just over a minute remaining with an empty net goal for the 3-1 win. The two wins boost the Bison men’s team record to 6-2-2 on the year, while the Bison women’s team record is 3-3-2. Next weekend the women host the UBC Thunderbirds, while the men travel to play UBC on the road. Both the men’s and women’s basketball teams lost to the Cascades on Friday at the University of the Fraser Valley. The women played a strong game, but were unable to keep up with the Cascades’ pace. Helped by a strong defence, which didn’t allow many Bison scoring opportunities, the Cascade blew out the Bisons 75-33. The men’s team had a slightly better outcome, but suffered from the same issues the women’s team did — strong defense from the opposing team — as they lost their first game of the trip 101-76. On Saturday, both Bison teams played the Trinity Western Spartans. The Bison women picked up their first win of the season in a game that went right down to the wire. With just over 20 seconds remaining, the Bisons found themselves ahead by one point, and extended the lead to three with a pair of free throws. The Spartans tried to tie with a buzzer beater for three, but it missed its mark, as the Bisons held on for the 59-56 victory. The Bison men’s team lost their game against the Spartans 95-68.